Have you seen the wonderful new blog hop from buzzmills and a happy stitch? My stop on the blog tour is not until August, but I had to make sure you were seeing all this amazing inspiration now! 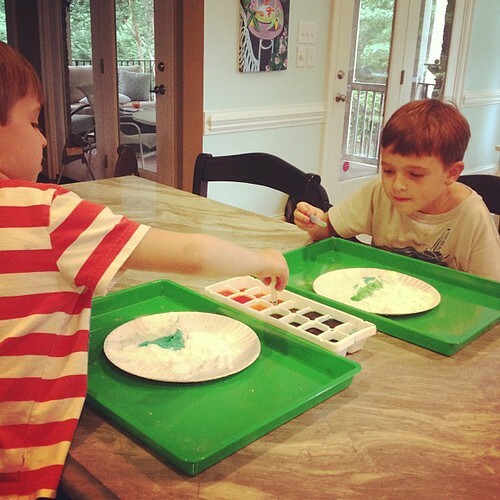 To get in the spirit of things, we are having Art Week at Mama Pajama School here in our home. Mama Pajama School this summer is not quite as intensive as last summer. I'm doing what I can and just trying to enjoy the baby and the boys and the summer. But really cool, outdoor art? That we can do! We've been collecting treasures for our Found Object Art project a la Peter Blake. The boys are really into the treasure hunting on our walks and excited about using the glue gun! 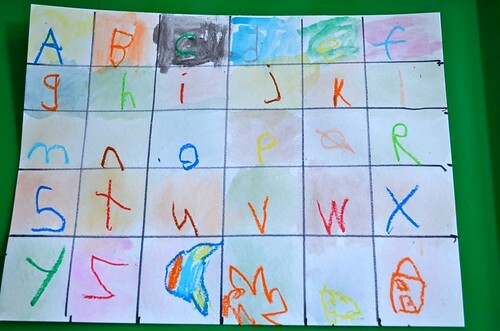 We also incorporated art into school with a sneaky way to work on penmanship with this pop art alphabet. As expected, Jack (age 6, still hates writing letters) did this project by the book, told me if you held the pastels by the paper they didn't make a mess, but still seemed to enjoy it. 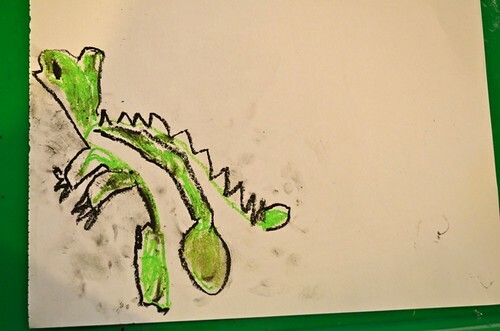 Also as expected, Will (age 4) grew bored with putting the letters in order, wrote random letters, ignored the watercolors, was completely covered in pastels and eventually turned his paper over to make this much more exciting dragon! We didn't have a spray bottle handy, but we had water guns, which might have been even more fun. We used liquid watercolors and the paint was very vibrant! They requested I make more chalk ice as and I am happy to do so. This was a great activity. 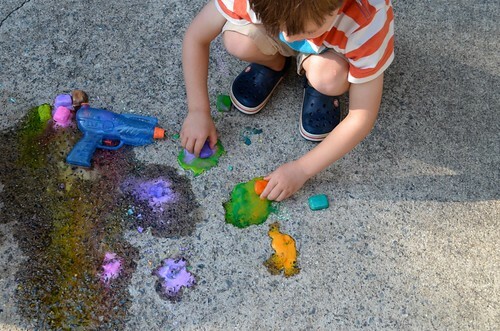 Next we are going to try the exploding paint bombs and exploding sidewalk chalk bombs! Talk about perfect boy activities! We have also been reading a few children's books about artists to get in the mood. I am a little nervous for my blog post. Will, only likes to do projects his own way with his selected materials (generally crayons or colored pencils, not a fan of paint) so I know that if my project is not really enticing, he'll just do his own thing (which is totally awesome normally, just not when you're trying to do a blog post)! Jack will go along with a project more readily, but I want it to be something he will get excited about. I was thinking Matisse with his bright colors and paper cutting collages, but I need to make it a little more fun and active. Wish me luck! How fun! Wish my boys and your boys could get artsy together. 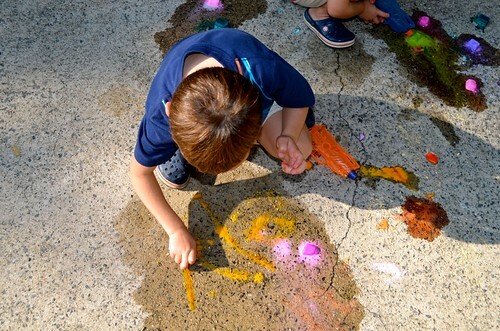 I can't wait for your Backyard ART Camp project and can't wait to see how your found object projects turns out! Yay for glue guns!! What a great idea! You are so creative and I know your boys just love it. Have you ever read the blog "Whatever" ?? 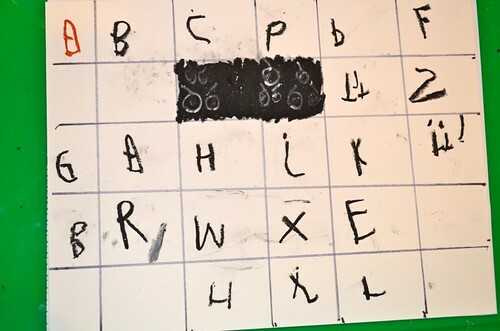 It's a great blog all around, but she also used to do this thing called craft Thursday with her kids, and it might be fun to look through her archives. I know whatever you decide to do for your post will be great!